Digital concepts and design solutions focused on conversion rates and results. Our creativity is based on solid strategy, careful analysis and 15 years in the trenches. Think of us as a strategic, creative partner. From the initial idea to the final launch. Everything from beautiful infographics professionally produced videos that boost awareness and sales. Creating a successful App is all about the prefect marriage between concept, user experience and design fitted to the target audience. ..
We deliver results for a number of large businesses and organizations – both international and Danish brands are among our current and previous clients. Collaborating with Red Cross and getting the opportunity to create results that have the potential to save lives is a great honor for us. We’ve worked with Danish Red Cross for quite some time now, and our assignments include: a persuasive redesign of their entire website, the transition to a new CMS, strategy workshops, responsive website optimization, new structure and user experience, as well as general advice and counseling. Abacus Medicine provides affordable medicines and reduced healthcare costs. Adlive designed the new logo, visual identity and design guidelines for the Abacus Medicine. In addition to this, we also designed and developed their website. ADLIVE has worked with L’EASY Business since 2010 and helped with most digital aspects of their business model. ADLIVE assists L’EASY Business on multiple levels – ranging from strategy, concept development, and campaign execution to continuous optimization of websites and campaign pages. We’ve worked with L’EASY since 2010 and helped them with most digital aspects of their business model in Denmark, Sweden and Norway. We assist L’EASY on multiple levels – from strategic sparring, concept development and campaign material in the form of banners and landing pages to continuous conversion optimization of various websites and campaign pages in the Scandinavian countries. We designed DLI’s logo, visual identity, and design guides as well as an optimized version of their logo. In addition to this, we also designed their medicine portal. Working with an organization the size of DLI takes a lot of focus and determination in order to make everything come together in a greater synthesis. We have helped them with everything from overall identity and mock-ups, to new digital concepts all way over to apps like medicin.dk which was developed in close cooperation with their marketing and development department. We’ve worked with the client since 2011 on a multitude of different digital aspects of their business model. We were the main partner and driving force behind a 2-year-long optimization project that resulted in a completely new, responsive e-commerce platform. In addition to this, we regularly deliver graphic campaign material, email templates, social media design as well as sparring on the more large-scale strategic decisions. We cooperate with D:E:R in developing their digital initiatives. We spend most of our time working on campaigns, website optimization and landing pages. But we play a role in most of their digital marketing and have helped them with promotional videos and social media design. THORN is D:E:R’s Norwegian and Swedish sister company. We help THORN with their digital campaigns in the form of banners, landing pages, website optimization, etc. We cover a large part of their Norwegian and Swedish initiatives in close collaboration with their other partners. LIF’s purpose is to promote the pharmaceutical industry’s interests both in Denmark and abroad; a challenging objective that requires clear and impactful communication. We helped LIF design their overall identity, optimize the logo, and develop design guides for the entire organization including templates and color palates. Founded in 2006 by designer and concept developer, Michael Lassen. We have extensive experience with everything from major projects involving large budgets and tight project plans to smaller projects that call for immediate action. ADLIVE draws upon a devoted team of freelancers and collaborators that includes some of the foremost thought leaders within the field of on- and offline marketing. This setup allows us to offer full-service solutions. We offer everything from counseling to final solutions – our goal is to be a strategic, creative partner for our clients. Not just a provider. We are deeply involved in all projects and work hard to deliver the best results. Strategic creativity grounded in years of experience with an analytical approach to all projects – We live by David Ogilvy’s “Keep It Simple Stupid” philosophy targeted digital media. The perfect KISS makes the difference. ADLIVE has provided a complete redesign of content, structure, and usability of the entire rodekors.dk, which is the main website for the Danish Red Cross. Concept and design for all onsite donation items, including input to the communication strategy, which ensure higher conversion rate. ADLIVE has since 2011 helped wupti.com with optimization and testing of their web shop platform. Since then we have collaborated closely with wupti.com and made a complete re-launch of the site based on results from years of optimization and testing. Ongoing optimization and testing of web shop and banners since 2011. Strategy workshops with wupti.com and developers. Sparring regarding wireframes and usability with developers. Design of completely new look and feel, including extensive color palettes. Development of 1:1 prototypes of all key pages including responsive examples. Provided concept and design for banners including display (both onsite and external). Design of review and test before launch of website. Management of ongoing testing and optimization in collaboration with wupti.com. ADLIVE has since 2011 worked closely with wupti.com on all their digital campaigns. Concept and design for all major digital campaigns. Design of overall look and feel for onsite and external banners. Production of banners for social media and eDM. Production of banners for affiliate, display and ownership. Development of banner templates for wupti’s internal designers and collaborators. ADLIVE has worked closely with wupti.com since 2012 on developing their email templates. Organization of workshops with internal CRM team and external teams of developers. Design of overall look and feel for all templates. Development of template designs for various communication types, ex. desktop and mobile. Design of banners, final graphics, and graphic templates for both dialog and campaign mails. ADLIVE work closely with L’EASY on all their digital campaigns including affiliate, remarketing, ownership, and cross channel activities in Denmark, Sweden, and Norway. ADLIVE used WordPress to provide a multisite solution for local departments. This resulted in an easy to use setup for the local departments, which focuses on profile pages, news, and blogs. 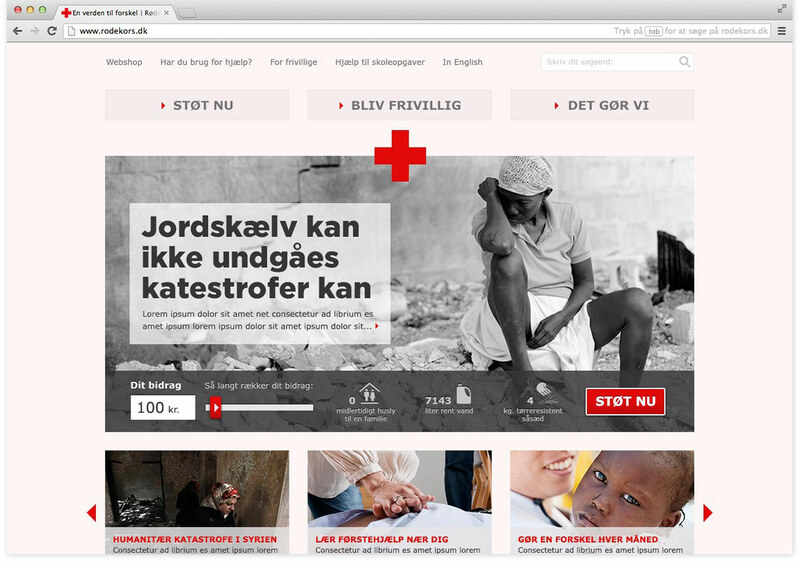 ADLIVE provided a complete optimization and redesign of the First Aid area on redcross.dk. ADLIVE has provided L’EASY Business with a complete redesign of their website, leasybusiness.dk, including finding the right cms system for the project. In order to support the new marketing strategy ADLIVE designed a new website with focus on customer needs, unique selling points, and the right positioning in the customers minds. ADLIVE handles all of L’EASY Business’ marketing activities including day-to-day coordination across channels. ADLIVE has provided L’EASY with a complete redesign of their website, leasy.dk. In order to support a new marketing strategy where digital allways comes first ADLIVE designed a new website with focus on customer needs, unique selling points, and the right positioning in the customers minds. ADLIVE work closely with L’EASY on upgrading their landing page templates. ADLIVE has worked with D:E:R on repositioning of the 20 year old electronic and finance brand. The goal was to create a more seriously and credible brand with focus on customer needs. Design and concepts was tested on different focus groups within the target audience during the development process. ADLIVE focused on a user minded intro where the user quickly choose their need and lands on a landing page focused on their needs with the simplest order flow possible. ADLIVE work closely with D:E:R on all their digital campaigns, including affiliate, remarketing, ownership, and cross channel activities. THORN is D:E:R’s sister brand in Sweden and Norway. ADLIVE helped with integrating the new logo and identity for THORN in Sweden and Norway. ADLIVE has provided a complete redesign of thorn.se and thorn.no based on the design for der.dk. ADLIVE work closely with THORN in Sweden and Norway on all their digital campaigns including affiliate, remarketing, ownership, and cross channel activities. Together with medicin.dk, ADLIVE has design the app: Indlægssedler, a tool to find information about medicine. The process involved concept development and design of all the iconography throughout the app. Available on both android and ios. Need a new and improved newsletter template? We have years of experience designing and optimizing effective email templates for a number of clients in various different industries. Designing the perfect email template is a complicated process that places high demand on both design and development. The template needs to work perfectly across devices, browsers and spam filters. Moreover, the template must be adapted to the client’s email platform in order to ensure a seamless newsletter send. Moreover, there’s a big difference between designing a template for an e-commerce that sells electronics and an email template for a charity that mainly is there to create awareness. When we take on a new email client, we always start with understanding the context the email will appear in, and them we move on to designing a template that will support and facilitate the specific conversion process. Creating a successful App is all about the prefect marriage between concept, user experience and design fitted to the target audience. Adlive will help you all the way from basic idea to finished App. Designing and developing an App is a complex process and there are many aspects that need to be considered along the way. User experience, design and interaction are crucial to building an App that really delivers. Moreover, getting everything to work perfectly within the limited space of smartphone screen is something that will make or break any App – regardless of how good the basic concept is. We can deliver everything from input and concept development to wireframes, one-to-one prototypes and finished design. Via our network of experienced developers, we can even offer you a complete App designed, developed and ready for use. Visual content establishes coherence and supports the messaging we want to get across on digital media. It’s easier and more cost efficient than ever to produce impressive content in the form of HD-quality video, animation and static graphics – imagination is the only limit. Today’s consumer is bombarded with messages and striking visuals all day – and it takes something unique to cut through all the noise and create a truly memorable experience. Identify critical optimization areas and boost your website conversions. Data, user-insight and testing are critical when it comes to effective optimization. In many cases, the key to higher conversions lies in optimizing core aspects of the website such as content, structure and layout. Only by understanding your audience can you identify how and where to make changes that will have an actual impact on conversions. We collaborate with some of leading specialists within the field of CRO and we can offer everything from feedback, analysis and split testing to final copy and one-to-one prototypes. Before committing to a complete redesign, it is a good idea to start with analyzing, optimizing and testing key areas of your existing site in order to gain critical insight so you stand a better chance of getting it right when you launch the final redesign. In our experience, the best goals are achieved when there is time to do in-depth research and analysis before the creative process begins. Crafting a truly responsive website that works on all devices is a complicated process that demands attention to detail and lots of research and preparation. All the different user scenarios must be taken into consideration, and wireframes must be built for all different screen sizes and methods of interaction. Moreover aspects such as whether to choose a fluid or fixed responsive design will have major impact on the design process and not least the finished product. Adlive has hands-on experience from a number of different projects that revolved around responsive web design – e.g. one of the most complex and extensive shopping experiences in Denmark, wupti.com. Adlive can help you regardless of whether you want a complete redesign or you need to optimize you current design and user experience. For the past decade we’ve delivered banner material and landing pages to some of the most well established brands and businesses in Denmark. Depending on the complexity and scope of the individual campaign, we can bring in our devoted team of freelancers that include some of the foremost competencies on LPO and A/B testing. Creativity is our driving force, but our focus is 100% result oriented. We believe that creative solutions need to be solidly grounded in data and analysis in order to achieve their full potential. Moreover, we firmly believe that test and analysis beats guesswork and personal taste. We can help you optimize your current banner campaigns and landing pages or build new ones for you from scratch. We are well-versed in developing and executing both on- and offline concepts that have impact across platforms and channels. Our focus is return on investment and we involve our clients in the process as this has proven to bring about the best results regardless of whether we are dealing with B2C or B2B concepts. ADLIVE offers concept development services on many different levels. We can help you build the basis for a new business or product from scratch or assist you in optimizing your current campaigns. No matter what your challenges are, we’ll meet them head on and tailor a solution to you unique requirements. In our experience, establishing a solid strategy is crucial to achieving online business goals. We offer our services as a strategic partner to everything from small startups and medium size businesses to large international organizations and brands. We don’t deliver grandiose reports or overly complex documents – instead we focus on giving actionable, strategic advice that’s easy to implement and align with the overall business goals of our clients. We bring more than 15 years’ hands-on experience to the table and offer actionable strategic advice in relation to communication, corporate identity, campaigns and overall online marketing and sales. From logo and overall look n’ feel to the finished design guide. ADLIVE delivers on everything from small and simple assignments to large and complex projects for B2B as well as B2C companies. 15 years experience has taught us that working with logo identity is a complex process where the best results are generated by working closely with the client during all phases of the process. Strategy, analysis and testing are just as important as creativity if you want to an identity that works across channels and positions you appropriately on the market. We value the historic background of the company brand. Therefore our approach is based on optimizing and building on what you have – rather than starting from scratch (unless we are dealing with a completely new brand of course). Before we finalize a new logo or identity for a client, we always make sure it undergoes thorough target group testing in order to ensure the best results and returns.